Polyphia return with fiery grooves, smooth riffs, and bubbly melodies on their new record, New Levels New Devils. It marks a point in their discography at which they have found the sound that best represents their scope of talent. Texas-based instrumental outfit Polyphia have come out with a new record. 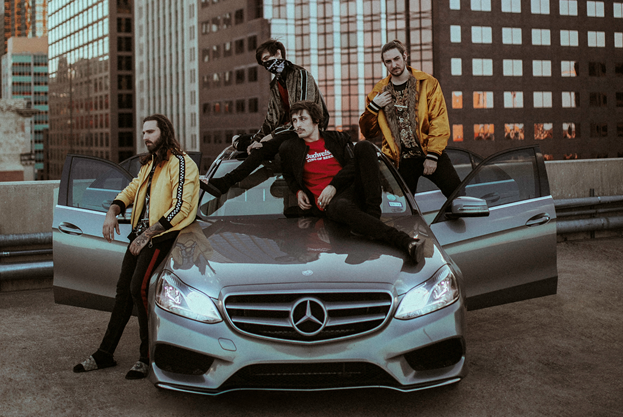 New Levels New Devils, released on October 12th, 2018, is their first release following the release of The Most Hated in 2017, which left Polyphia‘s fanbase in anticipation of what would come next. The EP marked a rather strong divergence from their previous material as found on records such as Muse and Renaissance. They honed in on hip hop/trap elements much more, focusing a lot less on technical proficiency and more on catchy hooks and songwriting in general. Let’s take a look at how the new record turned out! New Levels New Devils opens with “Nasty”, which features guitarist and solo artist Jason Richardson. Upon first listen, I was not all that surprised to hear the rather smooth and bubbly tonality that has characterized Polyphia throughout the majority of their discography so far. However, the dark vibe of the singles you might have already heard (“G.O.A.T.” and “O.D.”) totally jumps out at you when you least expect it. The immediate shift into a more sinister and dark mood is very compelling, and the syncopated, groovy rhythmic ideas don’t hurt either. These motifs are very percussive, and as you listen through the record, you’ll notice that they lean heavily on this percussiveness, using it as a tool to add to their grooves. Regarding Richardson’s solo: although his tone is rather blocky, which contrasts those of guitarists Tim Henson and Scott LePage, it is a nice addition to the dark style introduced on New Levels New Devils, as Richardson is already well-known for his knack for playing intense and abrasive styles. If I had to choose a favorite track off this record, it would probably be “Drown”, featuring the phenomenal guitarist Mateus Asato. Although Polyphia are famed for having an uptempo and straight-ahead approach to their sound, this track takes it way down and focuses on fluidity and smooth grooves. I especially appreciate the drum work of Clay Aeschliman and his tasteful use of crisp splash cymbal accentuations. His cymbal work gives the track what I would describe as an aquatic and fluid sound. This compliments the guitars’ buttery riffs nicely. Now to Asato’s solo: my God is it wonderful! It creeps up from both the low register and a low volume, subsequently transitioning seamlessly into a plethora of bends and emotionally packed phrases that are sure to leave the listener in awe. This stands in sharp contrast to Richardson’s solo, which demonstrates the versatility of the songs Polyphia wrote for New Levels New Devils. “Saucy” is a trackt hat alows bassist Clay Gober’s to really showcase his talent. He lays down solid, percussive lines throughout, especially in the prominent bass break; although very short, it adds a huge punch and pop to the song. This even makes sense on this song, as the guitars display a lot of bass-like qualities. It almost seems as if the song was written just for a chance for Gober to shine. Polyphia clearly have a rather formulaic approach to songwriting, but it is nevertheless interesting to observe their ability to keep the listener engaged with the different twists they give each of their songs. This was something their earlier releases like Muse and Renaissance lacked. However, it seems that they have identified this problem and took care of it. Polyphia‘s return did not disappoint! They have brought a new set of skills and timbre to the table, and really upped their ambition and maturity in their songwriting. Them dipping their toes into new tonalities and moods has really added to the substance of their music overall. Yes, Polyphia often have a divided audience; some vehemently oppose them and their music, hence why their latest EP was titled The Most Hated. But Polyphia simply don’t care. They make music to have fun, and it really shows, not only through their recorded output but their live performances as well. New Levels New Devils is a phenomenal comeback, and I can not wait to hear more from them. Previous PostA SCENE IN RETROSPECT: The Dear Hunter - "The Color Spectrum"